The purpose of this Joomla news module is not to catch existing Joomla articles as Hot Joomla Carousel Pro, but to allow users to add content (heading, pair of images and few sentences of text) into the module itself. The content units (slots) can be linked to the existing articles if needed. All settings and content of the module are in the module parameters. There you set many parameters and also content text and images. Overall module dimensions, as well as dimensions of left and right column are customizable. 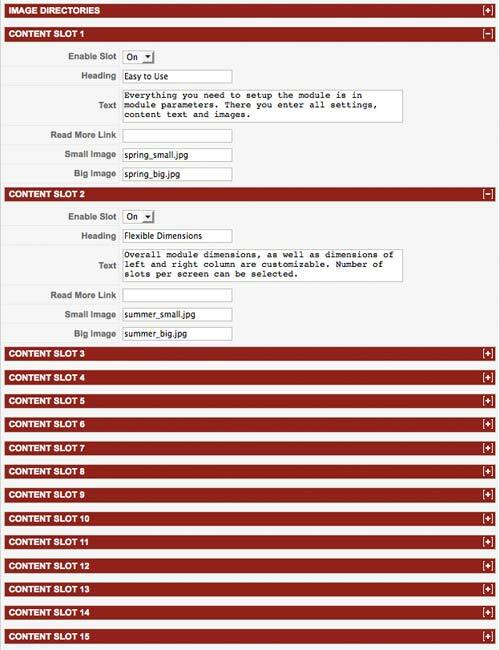 Content units are organized as slots in module parameters. Number of slots per screen can be selected, and each slot can be enabled and disabled. Text style of headings and content is changeable. You can select font family, size, weight (normal or bold) and style (normal or italic). 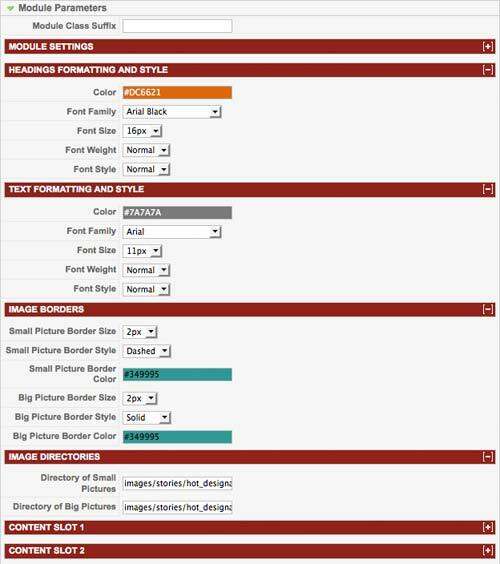 Image borders are fully customizable, so you can set border width, color and border style. We used dashed for small and solid for big images on our demo. You have control over animation speed of up/down scroll of the left column and over fade effect speed of the big images. Auto slide is also available. You can see how the Joomla rotating news - HOT Designation module works live on our Joomla Demo Server. Also, you can check the screen shots of the module backend on this page to get better idea what you can do with this module. In order to be displayed in rotation, each slot should be enabled (select Enable Slot: On). You can rotate up to 15 slots per page. It's possible to add more, but we don't recommend it, as your page may become to "heavy". For such custom features, check our Hot Joomla Support Forum. 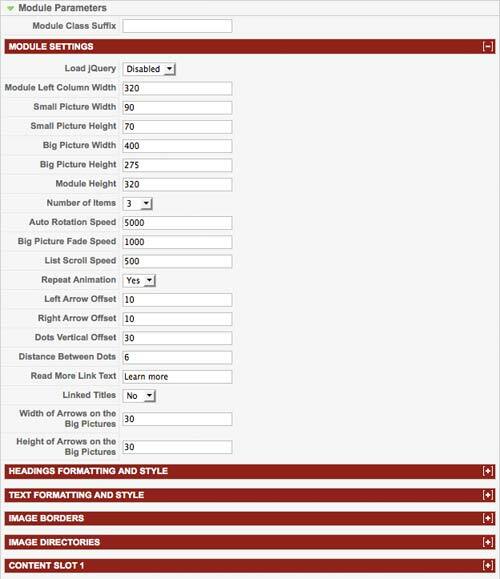 Full control over the module dimensions (width and height), and left and right column widths. Number of slots displayed on slide. A small and a big images for each slot, and dimensions of those images. The "Read more" link for linked articles. Titles can be linked or plain. For both headings and plain text, you can change font color, family, size, weight (normal or bold) and style (normal or italic). Animation parameters for up/down scroll and fade. Auto slide duration. Position and size of left/right arrows on the big image. Distance between dots under the big image. Small and big image border parameters (width, color, style). Directories on your server for small and big images.